Click on the map link on a paint site address below to go to Google Maps for that paint site location. Rancho Cañada del Oro OSP is located in the foothills of the Santa Cruz Mounts and has wildflowers in the meadow and hillsides in the springtime. 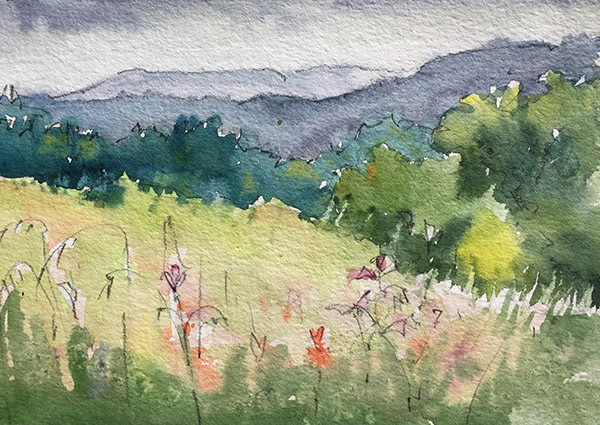 For hikers, naturalist and paintsite regular Edward Rooks will lead the hike, stopping at several locations with different vistas allowing time to sketch. Take your lunch and your stool with you and travel light on the painting supplies. For non-hikers the parking lot is adjacent to a meadow which is surrounded by trees and sometimes is full of wildflowers. There is also a paved, ADA and wheelchair accessible Llagas Creek Loop Trail (0.5 miles) for a very short hike. The preserve has a restroom but no water, so bring your own water. Directions: GPS alert: not all GPS are accurate in this area. Only trust your GPS if its directions match these directions. From US-101 S in South San Jose take exit 373 to Bailey Ave, turn right (west) on Bailey Ave and go 3 miles. Turn left onto McKean Rd and go 2.4 miles. Turn right onto Casa Loma Rd and go 1.7 miles, and the preserve will be on the left. The road will narrow before you reach the preserve. We have been invited to Hakone Gardens by SCVWS member Kay Duffy, who will be at the gate to let us in at 10:00, so please try to be there at that time. This is a lovely Japanese Garden with stone lanterns, Japanese houses, koi ponds, waterfalls, wooden bridges, and dwarf pines and maples, and hopefully with some wonderful blossoms. Please do not block paths with your painting equipment. Bring lunch but eat only in picnic area. Normal fee waived because we are considered Kay’s “students” for this paintout. Directions: From downtown Saratoga, drive west on Big Basin Way to Hakone, look for sign on left, just outside of Saratoga. It is 0.6 mile from intersection of Highway 9 and Saratoga Ave to the turnoff to Hakone. The road is a steep and narrow uphill road. There have been a couple of changes of plan. We finally settled on Palo Alto's Lucie Stern Community Center, an attractive Spanish Mediterranean-style complex built in 1934 which houses the City of Palo Alto’s Recreation Department, Children’s Library, and two theaters. 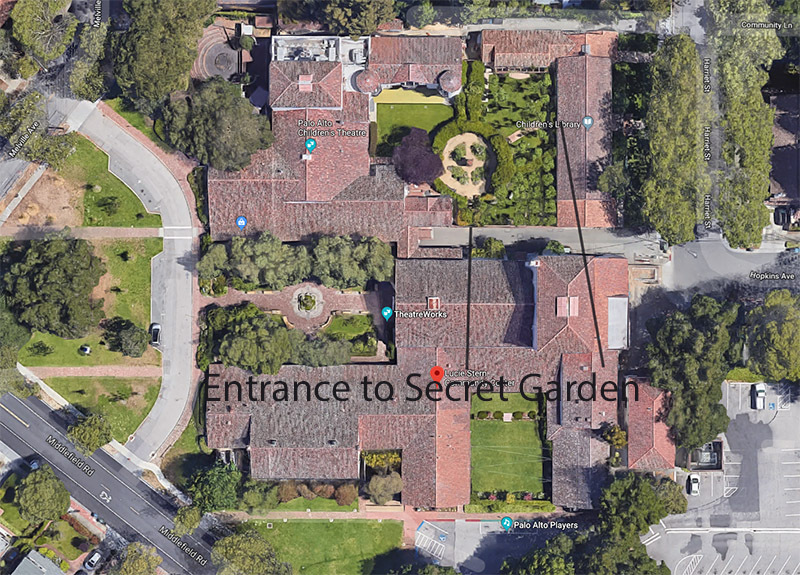 We have permission to paint in the "Secret Garden" behind the Children's Library where we can get great views of the garden, the Wishing Well, and the turrets of the Children's Theater. Directions: From 101 in Palo Alto, exit at Embarcadero Road and drive west for about 1.4 miles. Turn right on Middlefield Road, drive 0.2 miles, and the center is on the right. There is a small parking lot off of Middlefield on the right just before you get to the Center, but it is currently limited due to construction of the Junior Museum and Zoo. If that lot is full, please park on the street. Do not park in the nearby restricted lot because Palo Alto is very serious about parking infractions. At the Skyline Ridge Preserve hikers will see a range of landscapes including ridge vistas, expansive meadows, a pond for nature study, and a quiet lake frequented by migrating birds. The starting location is located near the David C. Daniels Nature Center on Alpine Pond, a good location for those who wish to sit and paint. The Hike and Sketch group will continue along a 2 to 3 mile loop through riparian, forest, chaparral and grassland habitat, returning to the Nature Center. Dress in layers because it could be much cooler at the top of the ridge than down in the valley. Directions to Russian Ridge Parking Lot: Drive south (up the hill) on Page Mill Rd until it intersects with Skyline Blvd at the top of the ridge. Continue across Skyline, drive only a few yards, and turn right into the Russian Ridge parking lot. Hikers meet at the parking lot at 10 AM. Painters walk through the pedestrian tunnel to the Daniels Nature Center and Alpine Pond. 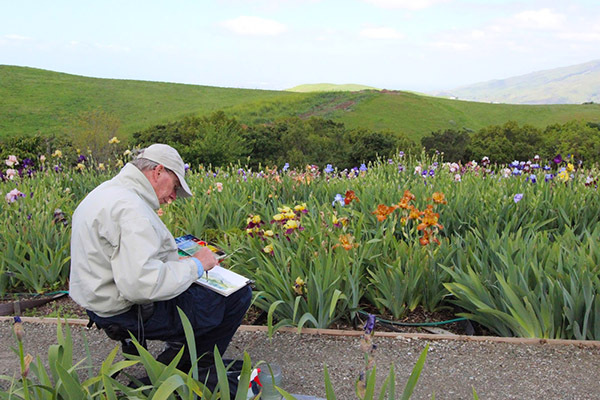 Beautiful iris gardens located in the east foothills of San Jose. The gardens are open for plant sales in the springtime only. This paintsite had been scheduled for late April but was moved to May 9 to capture the irises in full bloom. Directions: Highway 680 to Berryessa Road East exit. Take Berryessa Road east to Piedmont Road. Turn left on Piedmont to 1st traffic signal and turn right onto Sierra Road. Continue up the hill on Sierra Road 2.1 miles. After passing a vista point on your left continue 50 yards and the driveway will be directly in front of you. The 5 1/2 acre Rose Garden has over 4,000 rose shrubs with 189 varieties, set against a backdrop of a cathedral of redwood trees. Directions: From 880, take either Bascom or Alameda. Turn onto Naglee Ave and go to Dana Ave. Street parking. We have the opportunity to paint plein aire at Hidden Villa again this May. They want their Thursday visitors, mostly school groups, to observe us carrying on a fine Hidden Villa tradition, “capturing the light and color of our farm and nature areas as it happens, while it happens!” Please be prepared for inquisitive children to ask you questions. Hidden Villa’s founder Frank Duveneck’s father was a famous plein aire master of the 1880s. The site of the beautiful Duveneck home was once a stage coach stop, now it is in a preserve with an organic farm, farm animals, farm implements, and old barns. After lunch, we may have an opportunity to tour the Duveneck home. It is a lovely home which contains a couple of Duveneck paintings. Directions: Interstate 280 to Los Altos Hills. From 280 take the Moody/El Monte turn off and go south on El Monte past the Foothill college entrance. At the next stop sign turn left and follow Moody Road for 1.7 miles to the entrance on the left. Pass the small parking lots near the entrance and continue to the main parking lot. Because we are their guests, the usual $10 parking fee is optional. We have permission to paint at this beautiful Pagoda which is a piece of Vietnamese Architecture dropped into San Jose. It is a place of worship for Vietnamese Zen Buddhists. Directions: From 101 take Tully Road South to McLaughlin. Turn left and go about one block and location will be on your left. We are invited back for spring at the farm! 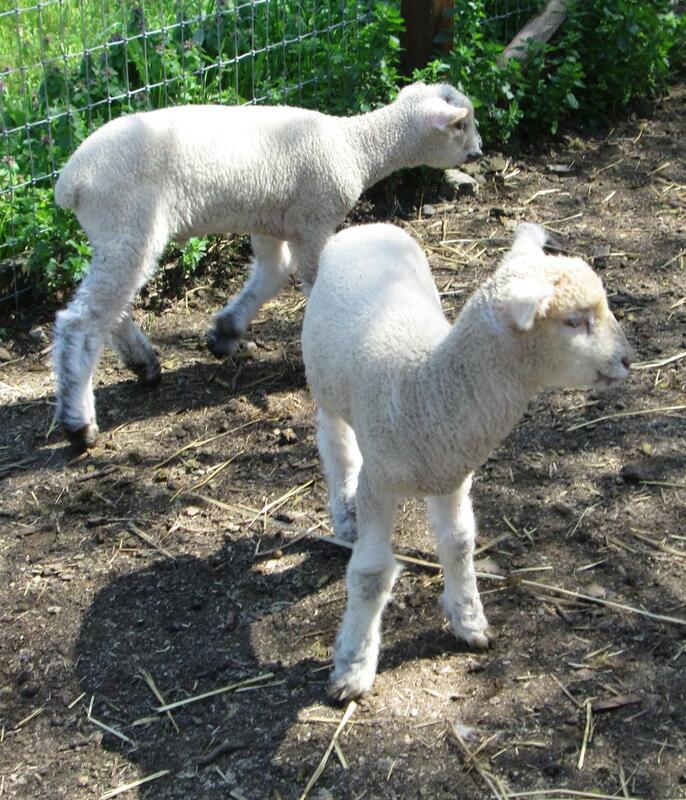 Come enjoy a day and you are welcome to quietly observe baby pigs, goats and lambs. Hidden Villa was founded by Frank and Josephine Duveneck, who purchased the land in 1924.Together, the Duveneck's lived on their ranch, "Hidden Villa," which was also used as a summer camp for poor, inner-city children and as a base for Josephine's social and environmental work. This private wilderness preserve stretches over 1600 acres of open space in the foothills of the Santa Cruz Mountains. Directions: Take Hwy. 280 N. to the El Monte/Moody Rd. exit in Los Altos and head west on El Monte Road. Pass Foothill College and turn left on Moody Road for 1.7 miles. Look for the Hidden Villa sign on the left. (26870 Moody Rd.) The $10 daily parking fee is waived when you mention you are with the Saturday weekend paint sites. Please park in the Main Parking Lot. San Jose Municipal Rose Garden Naglee Ave & Dana Ave San Jose, CA 95126 We added this bonus paintsite due to the color that our late spring rains brought to the garden. The Municipal Rose Garden is always a great paintsite. 10:00 am 1:00 pm, restrooms on site. 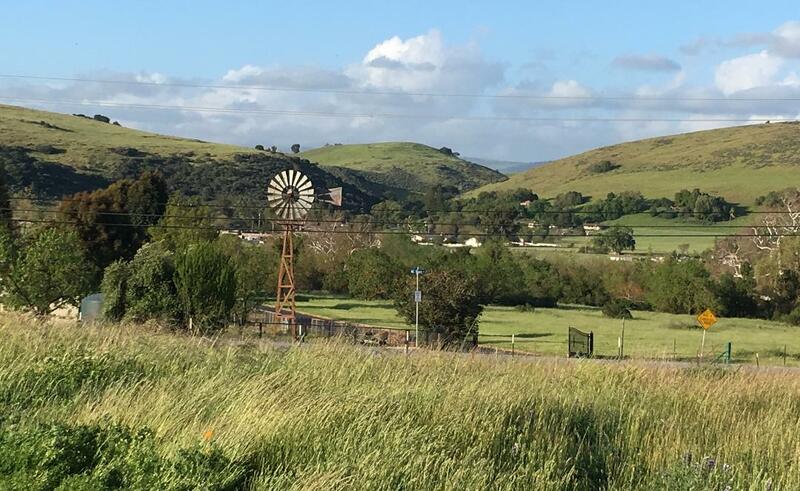 Rancho San Vicente showcases some of the best of the South Bay countryside, as it is preserved in Calero County Park with view of the foothills of the Santa Cruz Mountains. The entrance has picnic tables water and flush toilets. The usual start time for the paint sites is flexible. The organizers will be there from around 10:00 a.m. and will always carry cell phones (numbers in Member Directory for Marilyn Perry, Jane Saltman) if you have trouble locating the group at the site. Alison Turner leads our weekend paintsites. Often people stay until early afternoon, having taken a packed lunch to eat at the site. After lunch we share our paintings and pictures are taken (if desired) for posting on the paintsite blog. In case of rain or other unforeseen events: Cancellation will be announced on http://www.scvws.org/ and on the home page by 8 AM on the day of the event. Cancellation will also be announced by email to members, but the timing of SCVWS paintsite email cannot be guaranteed. ©1999 - 2019Santa Clara Valley Watercolor Society. All Rights Reserved Worldwide. Artwork on this site is copyright the individual artists and may not be used without express permission.